Mount Big Ben, VK3/VE-105, is an easy 6-point Summit close to Yackandandah and about a 40 minute drive from home. 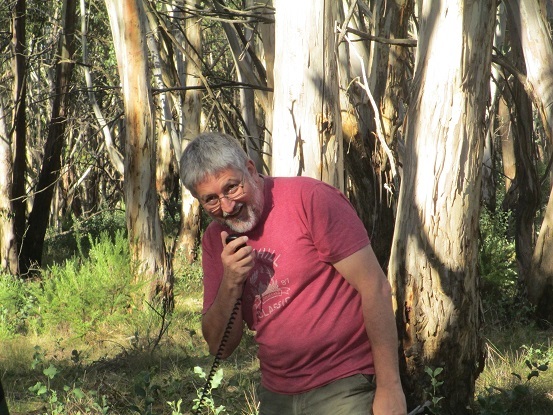 It’s also the location of the VK3RNE repeaters, which on 147 and 438MHz cover a substantial part of northeast Victoria and well into southern NSW. It’s a popular SOTA activators destination, having been activated 5 times now. That’s nothing compared to the number of activations some European and North American Summits get, but it’s well up in the league tables in VK. My lady and I had intended to activate Mt Big Ben the previous week but on that occasion rain stopped play and we ended up diverting to Yackandandah for a coffee instead. Whilst that was very pleasant it didn’t get any more points in mine or the chasers’ SOTA logs, so with fine weather forecast, a second attempt was called for. Mt Big Ben is one of those easy Summits that you can drive all the way to the top if you are so inclined. There are a couple of commercial repeater installations on the top, in fenced compounds some 300m apart. 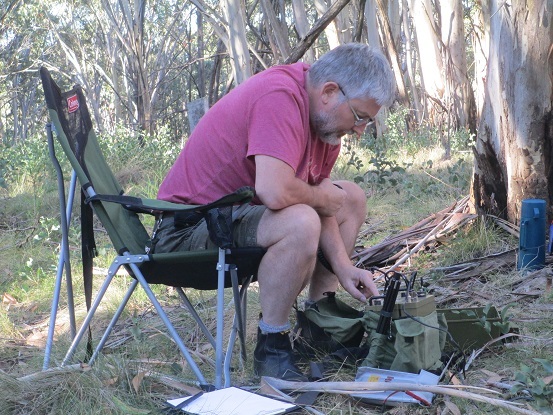 Between them there is a wooded area which offers plenty of room for setting up a portable HF station, complete with tree branches at the perfect height for hanging the antenna. A little separation between the SOTA station and the repeater sites is always a good idea I’ve found. We took a leisurely drive down through Wodonga to Yackandandah and, resisting the urge to stop for a coffee, continued on to the Summit. The trail leaves the Yackandandah – Dederang road and crosses open farmland for a kilometre or so before reaching the gate into the Big Ben State Forest. The trail is well-graded gravel and is easily traversible via 2WD vehicles. There are many 4WD trails in the forest and it’s advisable to stick to the main trail unless you fancy a misguided tour of the place on your way to the top. We arrived at the Summit and spent a few minutes checking out the lie of the land, eventually deciding on a spot halfway between the two repeater sites to set up. We’ve got the set-up routine down pat now and were on the air within ten minutes. I started on 7MHz where after posting a spot on SOTAWatch I soon found myself working through an orderly pile-up of chasers. Over about 45 minutes I worked VK3PF, VK3CAT, VK3FPSR, VK2TWR (at home for once! ), VK1EM, VK2DAG, VK2IO, VK2HRX, VK2UH, VK3EK, VK2CCJ, VK1MA/M, VK3YY, VK3AMB, VK5LY, VK2XD, VK3VBI, VK3FRDL, VK3ASC, VK3ANL, VK3HRA/P (S2S on VK3/VT-002) and VK1NAM/2 (S2S on VK2/SM-093). After a short break for a cup of tea, I put the FT817 away and changed over to the Barrett 940. I figured its higher power might help on 14MHz where I hoped to catch Mike, 2E0YYY. I could hear a few VK chasers calling him but his signal was way down in the noise. We decided that since the sun was getting low and it was getting a tad chilly we wouldn’t hang about to see if Mike’s signals improved as the evening came on. I worked VK2HRX, VK5PAS and VK5AV just to prove that the Barrett was still working and then we packed up. If the band’s not open you won’t work any DX regardless of how much power you run. The Barrett 940 really is a pain in the proverbial. It’s too big, too heavy and channelised operation doesn’t suit Amateur operation. Autumn is here, so take warm gear even if it’s a nice, sunny day.